Your feet are the fulcrum of the pendulum action of your body on a board. 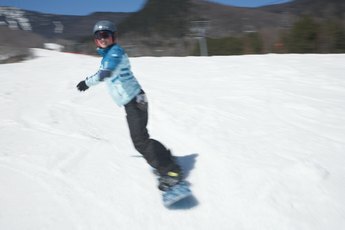 Snowboarding looks like a combination of an infinite number of unrelated movements. The truth is, the beautiful fluidity of gliding down a mountain on a snowboard is simply a matter of keeping your body in the right position in relation to the slope of the hill. Your body works like a pendulum that swings back and forth on a fulcrum -- your feet and, by extension, the board. 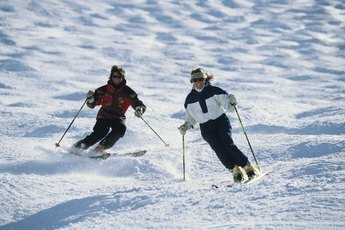 How you position your undulating body in relation to the slope determines your ability to carve, turn and stop. In order to maintain the relationship between your body and the slope of the mountain, you must follow the fall line. Locate the fall line. 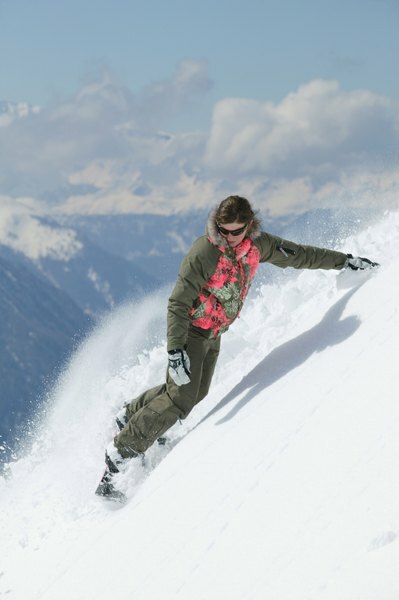 Stop at the top of a run by turning your snowboard parallel to the slope, so your chest is faced downhill. Look down the run -- or slope. Read the contours of the slope and determine the path a snowball would take if it rolled to the bottom of the hill from your location. Look at the contours of the slope and locate the path of least resistance, the course a head of water would take if it ran down the ski run. Depending on the contours of the slope, the fall line is not always straight below you and it's rarely a straight line. Jump and twist your shoulders 90 degrees -- your hips will follow -- so your board is pointing down the fall line and you begin to slide down the hill. With your chest parallel to the fall line, turn your head so your chin is directly over your downhill shoulder. Look out in front of you 20 to 30 feet, depending on your speed. The faster you go, the farther you look down the fall line. Your hands will naturally go out to your sides and up. One hand should be pointed down the fall line, the other up the hill. Rotate your arms to move your hands forward and create a 30- to 45-degree angle between your arms and your chest at the same time you roll your weight onto your toes. Keep your shoulders over your knees and your knees over your toes as the snowboard begins to carve away from the fall line. Continue looking down the fall line by looking over your shoulder as your board carves. Before the fall line gets out of sight, move your hands behind your chest by rotating your arms as if you were going touch your elbows behind your back. Stop when the angle between your arms and your chest reaches 30 to 45 degrees. At the same time, roll your weight back onto your heels to initiate a turn back toward the fall line. Initiate another turn on your toe-side edge once your board has swung back to the fall line, and across it as your board carves on your heel-side edge. Always keeping your eyes on down the fall line, carve back and forth -- from heel to toe -- as you slide down the slope.